Check out what this gift pack includes and find out about the site Wow gift boxes you’ll be impressed! There is also a special discount for all our readers yay! FATHER’S DAY GIFT BOX GIVEAWAY! are Super excited to be Hosting this event for you! We purchased this Gift Box from a new Gift site called WOW Gift Boxes! We found it very inspiring and wanted to help support them, by purchasing this Gift box to giveaway! They also Donate for every 10 Boxes they sell to charity! Visit their site HERE! I found it very inspirational! This is the perfect time to send a Graduation and Father’s Day gift coming up soon. 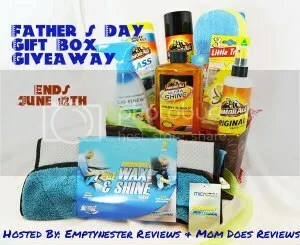 Don’t miss out enter for your chance to give some wonderful dad (or wonderful man whose not a dad) this amazing gift box! If you don’t win don’t forget about the special discount mentioned above! A 1972 Dodge pick up truck. A woody. Gosh that was forever ago! Don’t recall ever having to wash a car until I got my own – then I just washed it when it needed it. My dad didnt make me but believe it or not when I was younger I wanted to help him wash the car. My Dad never made me wash a car! Ford ltd, as kids we washed the car because it was fun not because we were told to do it. Our brand new Caprice, circa 1974 lol. I think it was a deep blue, almost black, mercury cougar. I washed our family car, an Oldmobile. My dad made me wash his van. If I wanted to drive it I had to wash it. It was always dirty so I was happy to wash it. Not to sound bad but in my family I am a girl and the girls do not wash their cars. I still let my brother wash my car when my husband is away.